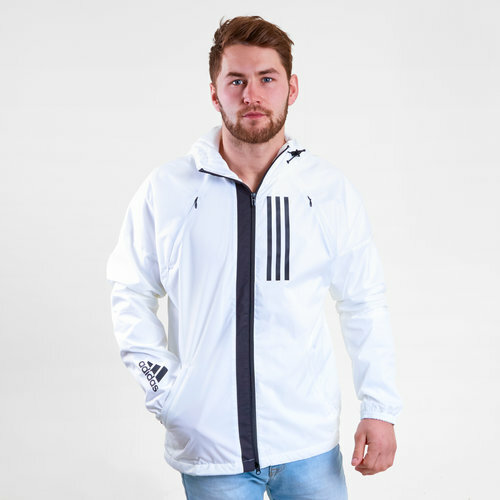 Stay dry and warm when you're out and about in that weather that can't seem to make up its mind about what it's doing with this adidas Fleece Lined Wind Jacket in Black and White. This fleece lined jacket from adidas has been designed to tackle wind and light rain. This hooded jacket will shield you from rain and wind to keep you ready for action. It can be used as a comfortable layer to pull on after boxing, dance class or a gym session when you're still cooling down. It comes with zip vents on the shoulders for when you need to cool down even more whilst the lightweight ripstop shell is lined with soft fleece which will make it warmer than the average windbreaker.